Propane is a byproduct of both natural gas processing and crude oil refining. Each of these processes creates a supply of propane that is shipped from the point of production to bulk distribution terminals. From these terminals, propane is transported via pipeline, rail, and tanker truck to retail facilities, where it is distributed in both bulk and cylinder form. Approximately 90% of the propane supply in the United States is produced domestically, while the remainder of the supply is imported largely from Canada and Mexico. Propane is transported via nearly 56,000 miles of pipeline and distributed at more than 6,000 retail locations. 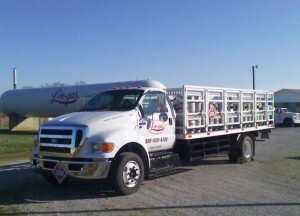 Because propane is a compressed, flammable gas, there are governmental regulations regarding its transport. Among those regulations are limits on Gross Vehicle Weight (GVW) and amount of time drivers are allowed to be on the road within a 24-hour period. These regulations create safety on the nation’s highways, but they place limits on how swiftly propane can be delivered. How did the shortage happen? The shortage is the result of a series of events that, taken individually, would not have as great an impact on the supply. These events include the shutdown of a Midwest pipeline for maintenance, a wet corn harvest season that called for the use of propane to dry the harvested corn, increased competition for pipelines and rail cars from the oil and natural gas industries, and, of course, the extreme cold that has stretched far into the Deep South. All of these factors together have taxed the production and distribution of propane, leading to the current shortage. Over 12 million homes in the U.S. rely on propane for heating and cooking. In addition, agricultural operations use propane to maintain proper moisture levels in stored crops, power facilities and equipment, and provide warmth for livestock. Many commercial and industrial businesses as well as municipalities use propane to power fleets and equipment. It’s hard to say how long the shortage will last, but some steps are in place to ease the pain a bit. Already the U.S. Department of Transportation has issued emergency orders in 10 Midwestern and 12 Northeastern states, permitting truck drivers to spend more time on the road within a 24-hour period in the quest to get propane supplies delivered further in a shorter amount of time. Many states are asking residents and businesses to conserve by lowering thermostats and limiting usage to only the most essential processes. Propane companies are limiting the size of deliveries and asking customers to only call once their supply reaches a certain limit. The one thing over which no one has control – the weather – will continue to influence usage and available supply for the foreseeable future.